Melt two bars of glycerin soap in a saucepan over low heat, stirring constantly until liquefied. Remove from heat and immediately add four drops violet food coloring, 10 drops fragrance oil and 1/4 teaspoon purple mica dust, stirring gently until blended. Pour the liquefied soap into the 2x3-inch rectangular molds. Let set for 30 minutes or until hard. Remove soap from molds and cut each bar into three lengthwise pieces. Follow Step 1 to melt two bars of glycerin soap, adding two drops red food coloring, 1/8 teaspoon green mica dust and 10 drops fragrance oil. Mold until hard, then unmold and cut into lengthwise pieces. 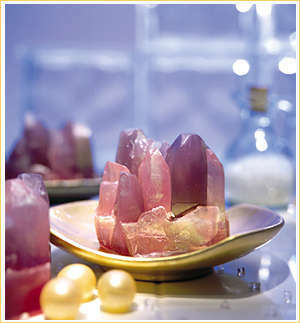 To make the crystals, refer to the photo and use the knife to cut small angled slices from one end of each soap length to form the top points. Cut 1/4 to 1/2 inch from the bottom ends to flatten and create varying crystal lengths. Follow Step 1 to melt the remaining two bars of glycerin soap, adding four drops red food coloring, two drops violet food coloring and 10 drops fragrance oil. Pour the liquefied soap into the 4x6-inch mold. Immediately arrange and stand the crystals on end side by side in the mold.. Let set two hours. Carefully remove the soap from the mold and cut into three to four bars. Rub green and violet mica dust with your fingertip on the some of the crystal points. Wrap the bars individually in plastic or clear cellophane. *mica dust is the material used in your favorite eye shadows and sparkly cosmetics. If you can not find it at your craft or hobby shop, try substituting very fine glitter or powdered metallic eye shadow!